للمسافرين الذين يرغبون أن يعيشو كل ما تقدمه مونت بولر, Grand Mercure Chalet Mt Buller Hotel هو الخيار الأمثل. يمكن من هنا للضيوف الاستمتاع بسهولة الوصول إلى كل ما تقدمه هذه المدينة النابضة بالحياة. إن سهولة الوصول من الفندق إلى المعالم السياحية الشهيرة الكثيرة في المدينة كمثل Mt. Buller Ski Slopes, ‪National Alpine Museum of Australia‬ هو استثنائي بحد ذاته. يعرف Accor Hotels بالمستوى الراقي لخدماته ولباقة موظفيه، وهذا ما ستجده في Grand Mercure Chalet Mt Buller Hotel. إن خدمة الغرف على مدار الساعة, مكتب الاستقبال على مدار الساعة, مرافق مخصصة لذوي الاحتياجات الخاصة, تخزين الأمتعة, رعاية أطفال هي جزء فقط من الخدمات التي تميز Grand Mercure Chalet Mt Buller Hotel عن باقي الفنادق في المدينة. بالإضافة لهذا,تتضمن كل غرف الضيوف مجموعة واسعة من وسائل الراحة . بعض الغرف توفر حتى تلفزيون بشاشة مسطحة, غرف لغير المدخنين, مكيف هواء, تدفئة, مكتب لإرضاء أكثر الضيوف تطلباً. إن حوض استحمام ساخن, مركز للياقة البدنية, ساونا, حمام سباحة خارجي, حمام سباحة داخلي هو المكان الأمثل في الفندق للاسترخاء وتفريغ طاقتك بعد نهار طويل. إن Grand Mercure Chalet Mt Buller Hotel هو خيارك لخدمة الفنادق الراقية في مونت بولر. 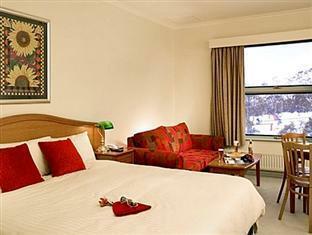 Spacious room, has a restaurant with quite a number of choices of food. Although very crowded, staffs were still very friendly. Team leader Wynston was friendly and approachable. Staff were knowledgeable, place was clean, facilities great .. definitely recommendable. It appears to be centrally located. We weren't able to stay because when we arrived (90 minutes BEFORE we told them we would) the Hotel was locked shut. There was no door bell. The phone gave us a recorded message. They STILL haven't called me back!! So we were locked out on a cold mountain and had to travel many miles late at night to find alternative accomodation. Total Fail, Mercure. I've been waited of an hour to check in as agoda put my information wrong to the hotel. After that I've enter to the room, the view is beautiful but that are lots of lacks. They don't even provide a microwave in the room. Sleeper is lacked, sleepwear is lacked, they combined two single bed to make it a king bed. However, the bed is too hard and we can't sleep well, and two single bed obviously don't make it as a king bed. They don't have after hour kitchen so we are starving over night. They juz put our luggages into level 2 after we checkd out, which is a public area that everyone can access, people don't even need to be a customer of the hotel, it could be anyone. And the luggages didn't put into a room even there is a room. They just put it next to the lift and say if there is any losses occurs, customers need to take their own responsibility. nothing to do up in the hill. overall stay was great. we stayed with two adults and two kids and the room was comfy. loved the heating in the room and bathroom and wardrobe! It will be best if hotel can provide a place to shower at portal area. Portal only provide us a place for changing. My kids were soaking wet after playing on snow. We feel checking out at 10am is too early. But the staff were great to allow 1 hr delay since we have 3 kids with us. No Internet in room. Only available at lobby area. Overall impression, location is good and nearby to ski rental and shops. It was good. Great location. Has pool spa and own bar. Nice and warm inside the room. Good commutation with staff members. Would recommend again.